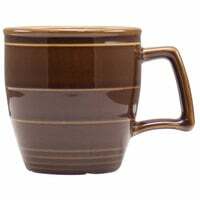 Serve a variety of hot, flavorful drinks in this Choice brown bell shaped 7 oz. china coffee mug. 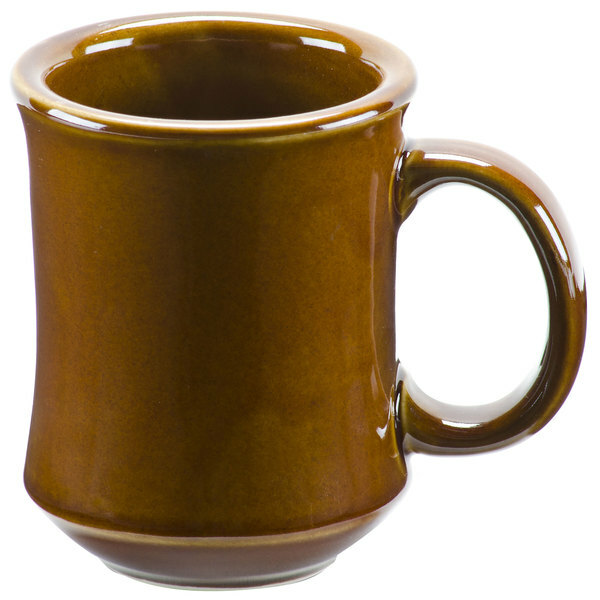 Great for coffee, tea, and hot chocolate, this mug provides simple style and function at your coffee shop, cafe, or diner. With its classic bell-shaped design, you can serve each drink with confidence to keep your guests coming back time and time again! "Customers enjoy these mugs. The color is nice, looks old fashioned. We use them to serve drip coffee, cappuccinos, tea, and cocoa. Easy to clean and a comfortable handle." This reliable 7 oz. 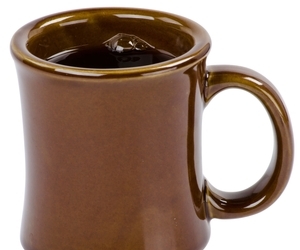 mug is the perfect size for drip coffee, tea, cocoa, or hot cider. The classic bell shape fits in with any establishment's decor, and thanks to the brown color, inevitable coffee stains will be hidden from sight. Featuring a convenient handle, this mug offers a sturdy grip to allow for easy sipping and carrying, perfect for when you're on the move! 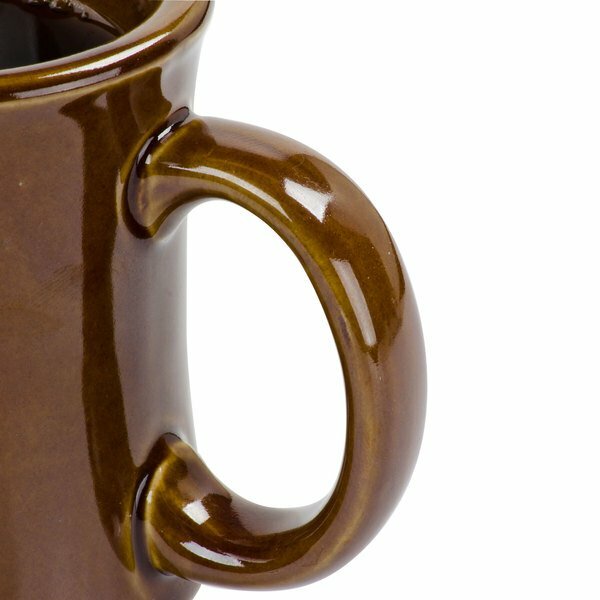 This mug easily remains upright on trays, tabletops, and counters thanks to its balanced construction. Boasting a narrow rim, this mug frames your drinks to enhance the presentation while also allowing for easier sipping for your customers. Great cup for a busy restaurant, wears well, keeps its color and washes great! Fits perfect in your hand, durable and unlike most, keeps the coffee hot! 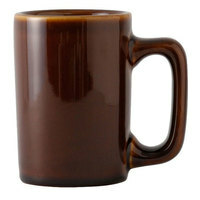 The Choice 7 ounce brown princess bell shaped china coffee mug is a great look and very nice quality coffee mug. The appearance looks rustic and we love them for our events. A great price per case as well. The 7 ounce brown princess bell shaped china coffee mug is lovely. 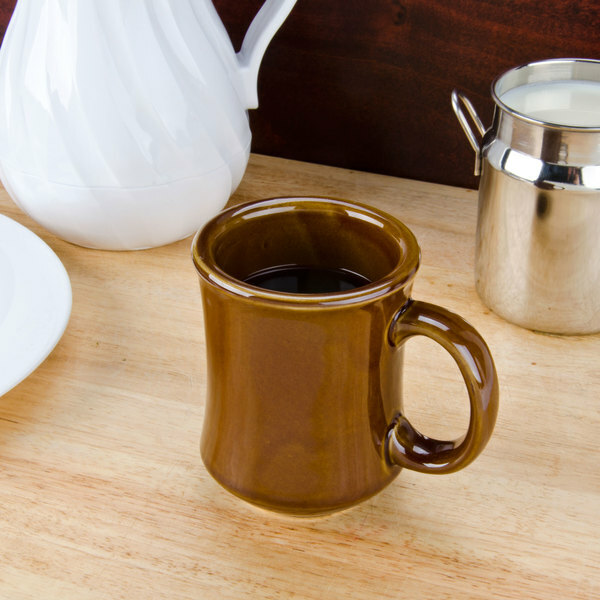 The mug is great for serving our coffee and very stylish and quality mugs. We have a wilderness lodge and were looking for some mugs to serve our hot tea. These are great and match our décor perfectly. They are the perfect size at seven ounces as well. The Brown Bell Shaped 7 oz. 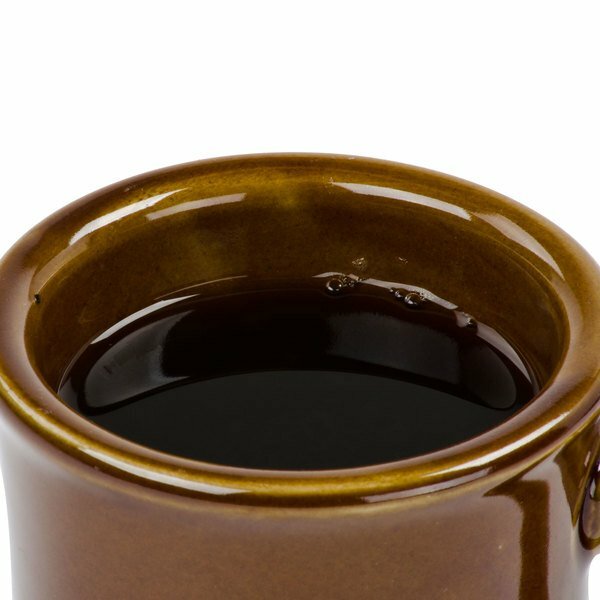 China Coffee Mug - 12 / Pack are great Mugs. Unfortunately one turned up with a broken handle, now its a great pen holder. Customers enjoy these mugs. The color is nice, looks old fashioned. We use them to serve drip coffee, cappuccinos, tea, and cocoa. Easy to clean and a comfortable handle. Exactly what I was wanting and expecting. The packaging was lacking however and I received broken mugs. Credit was issued but fragile products should be handled a little better. This mug is perfect for coffee. inexpensive but nice looking. We wish there are some light color and dark color, so we can use is as decaffeinate and regular coffee. These coffee cups are a good size so coffee refills are reasonably spaced out. The cost is about half of what the food company wants to charge me as well! 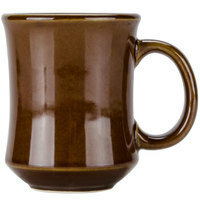 Great quality Mugs, this mugs take the every day use and abuse, dishwasher safe and very heat resistant. we use the mugs for coffee and for pots de creme too!!!! Inexpensive solution for quickly getting cups into the restaurant. Will eventually replace so didn't want to spend a fortune, but these are weighty enough for balance and customers do like them. Great size for coffee to keep margins in check. Great product for a great price. Good design and color for a coffee cup. Durable material and easy to wash. Great for portion control and dishwasher safe. thay look very nice to me. the bell shape is very nice and stylishie. rill light in weight.great in color. looks like it wood coast alote. We were using white coffee mugs.Then I discovered this color. Our customers absolutely love it. Shape and color is beautiful. Price is exelent. Was shipped in very short time. Good quality for a good price. These coffee mugs were a must buy for me! As soon as I saw them, they reminded me of my favorite diner that I visit every Tuesday night! Now I can have that diner coffee feeling at my house! I've searched for years for a cup that would keep my drink hot like those cups in restaurants. I found them here, ordered a dozen for myself. Came back today to order a few dozen for Christmas gifts! Everyone, including our customers, love these mugs! The bell shape mug is attractive and stylish and size is perfect for coffee and/or tea! The color of these mugs goes well with our bakery! We love them! 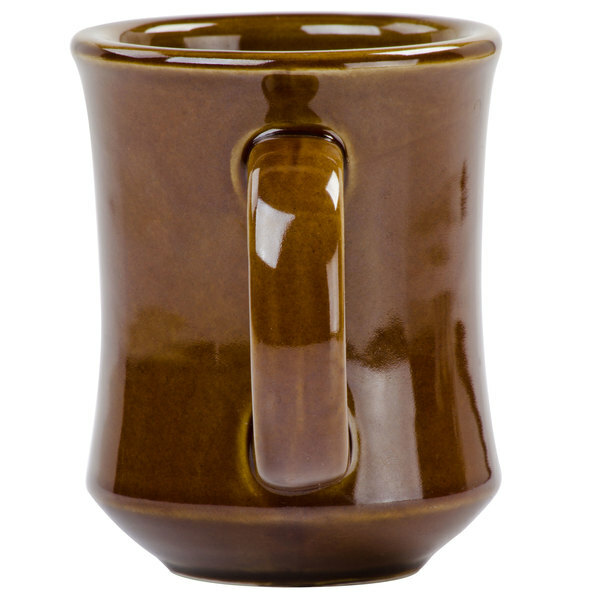 This bell shaped coffee mug is not only a stylish addition to any establishment but its lightweight for a mug! A good match for dining rooms with dark colors!! Not bad for the home either! This coffe cup has the perfect simple buy stylish look. It makes you think you're having a cup of coffee at your home. Fitting style and size for my diner.